Content is being archived weekly. Many pertinent articles regarding Transportation in the DFW Region are in the archives. DFW Regional Concerned Citizens attempts to examine issues from all directions. When a story says "By Faith Chatham" it contains my viewpoint. When it is by others, but posted by Faith Chatham, it is from someone else's viewpoint. When I discover contents which is on topic for this site, I frequently link to other sites. Usually those sites contain content which differs from my viewpoint (and frequently that of other members of DFW-RCC). "No man's life, liberty, or property is safe while the legislature is in session. - Mark Twain (1866)"
on local, regional, and state policies, legislation, and issues. Representative government depends upon proactive participation by citizens. The RTC of the NCTCOG voted 26-10 to recommend that the Texas Transportation Commission award the contract for SH 121 to the North Texas Toll Authority. NASCO Corridor - North America’s SuperCorridor Coalition, Inc.
Texas High Speed Rail Corp.
FM 2499 Section IV Preliminary Design Schematic Northwood/Castlewood to N. of Bishop Rd. FM 2499 Preliminary Design Schematic - Spinks Rd to Aberdeen Dr.
Issues we are watching are: transportation financing, toll roads, public/private partnerships, eminent domain, environmental issues such as air, water and gas drilling ordinances, pipelines and their impact on north central Texas. We are interested in the process of government, open meetings, elimination of conflicts of interest among decision makers, and application of all tax revenue to the public good. Most members are concentrated in the DFW region (16 member NCTCOG region) but we are joined by others who value constitutional government, and hold the ability for elected officials to give "fair and impartial consideration to issues" as a sacred trust. Corruption thrives when citizens slumber.We dedicate our efforts as vigilant sentinels, citizens claiming a seat at the policy table through calls, letters and e-mails to elected officials and attendance at public hearings. UPCOMING MEETINGS - open to the public! Angela Hunt - Trinity - Park? 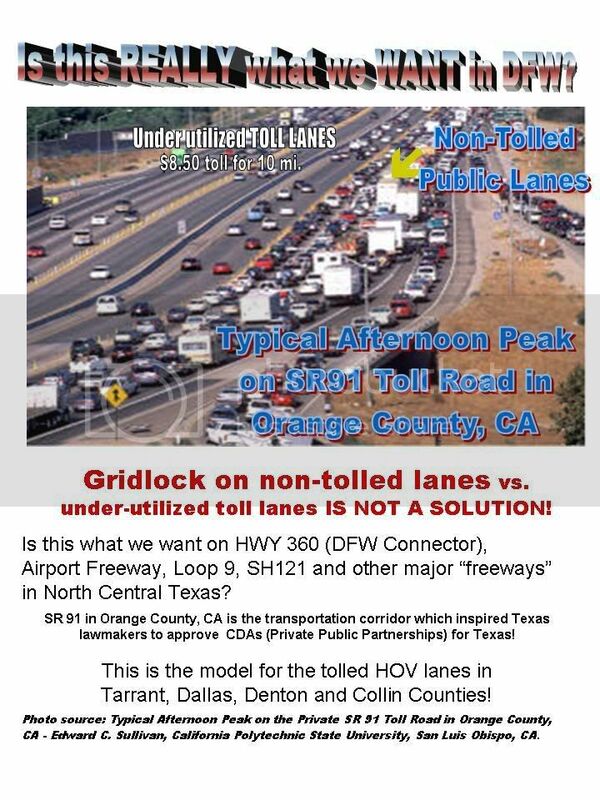 or Toll Road? Army Corp Letter Apr. 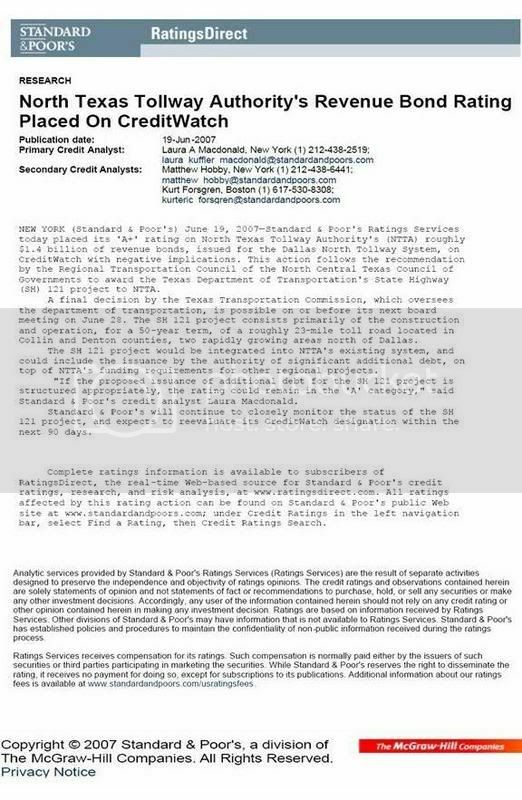 2007 - Federal Flood Protection Program - Proposed Toll Road within the Floodway is first major road in country proposed to be built in a Federal floodway. There are 34 State Representatives and 9 State Senators serving districts in the NCTCOG region. We are concentrating activism in this area because the NCTCOG is the body which plans and approves transportation, social services, environment, educational grants, law enforcement initiatives, homeland security projects and other critical intergovernmental initiatives and programs for this region. It is virtually hidden from the public eye. We are working to change that. By law they are required to "proactively seek public participation." Legally the citizens have been granted a seat at the table. We are working to equip citizens to assume leadership roles in claiming our seat at the table where critical decisions impacting our lives are debated and decided. by FAITH CHATHAM - Senator Carona lost this one for the people. His refusal to leave Lois Kolkhost's 2 Year Toll Moratorium alone, while it was a short simple bill and had the support of the majority of the House and Senate, cost the people of Texas. Carona insisted that the bill become his big, bulky Transportation Bill containing more provisions on how to build highways as 50 year CDA toll projects than provisions on how to stop CDAs. Carona, (R-Dallas) started the session with the popularity of Jesus on Palm Sunday. He ends it with a black-eye and most voters blaming him for the failed moratorium initiative. In political life it is better to promise nothing and do nothing than to lead the voters to believe in you and then betray their trust. The Governor can help legislators raise campaign money, but the voters still hold the trump card when it is re-election time!